Maple apple butter is a delicious twist on the old-favorite. Rather than being overly-sweet this version uses just a touch of maple syrup to highlight rather than overpower the spiced apple flavors. This lightly sweet and spiced apple preserve is perfect on toast or pancakes. Heck, it even makes a delicious dessert topping for ice cream or pound cake. It will also make a great gift, so don't be shy in making a big batch or several. Supposedly softer apples work better. That makes sense in that they'll cook down better for a texture standpoint. However, use whatever apples you can find and just cook until soft. Fruit butters need to be thick and that thickness comes from removing the water rather than adding pectin like in jams. Doing this slow removal of water in the slow cooker saves some hands-on work. You could do it on the stovetop but stir that quite often (almost constantly) to avoid scorching. The house will smell amazing while the butter cooks down. This recipe is for a very large batch (you will need at least a 5-quart slow cooker – larger even better) cutting it in half will work just fine for smaller slow cookers. As the apples get pureed, I don't peel them. A person could peel, if they're so inclined but skipping the step saves time and energy. If you're going to do the pureeing by hand rather than with a blender, peeling might make more sense but honestly it is unnecessary. 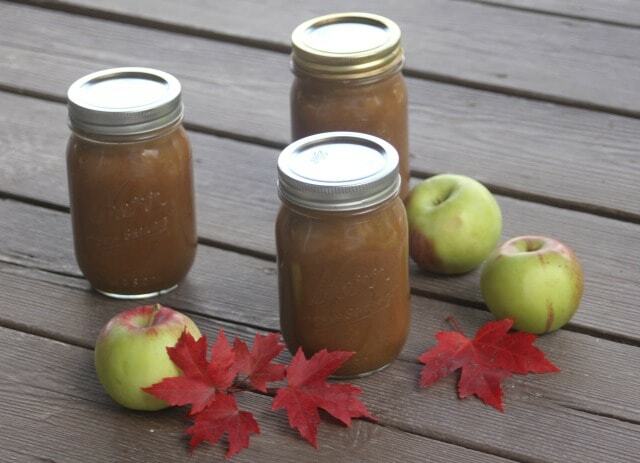 Try as I might, I could not find a tested & approved apple butter canning recipe that included maple syrup. I saw different variations posted on other recipe sites and blogs but nothing by my usual trusted sources. To that end, I decided to can this as if it were applesauce not apple butter. 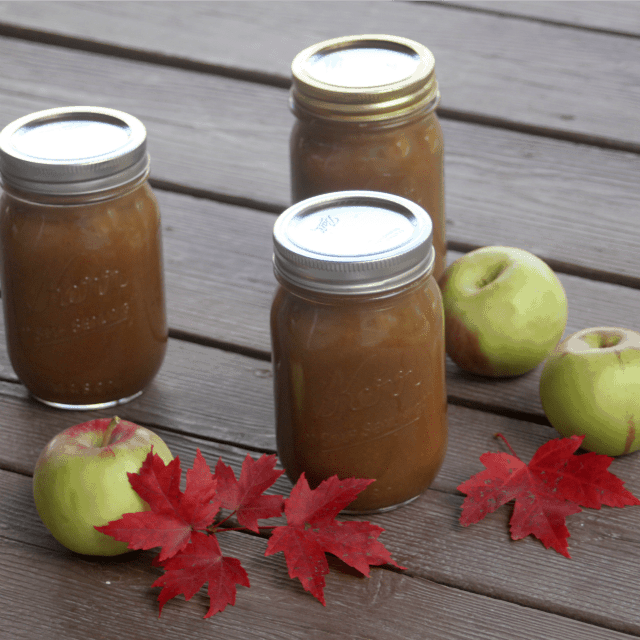 Normally, apple butters are canned as a jam or jelly – meaning about 10 minutes but they usually have a lot of sugar. 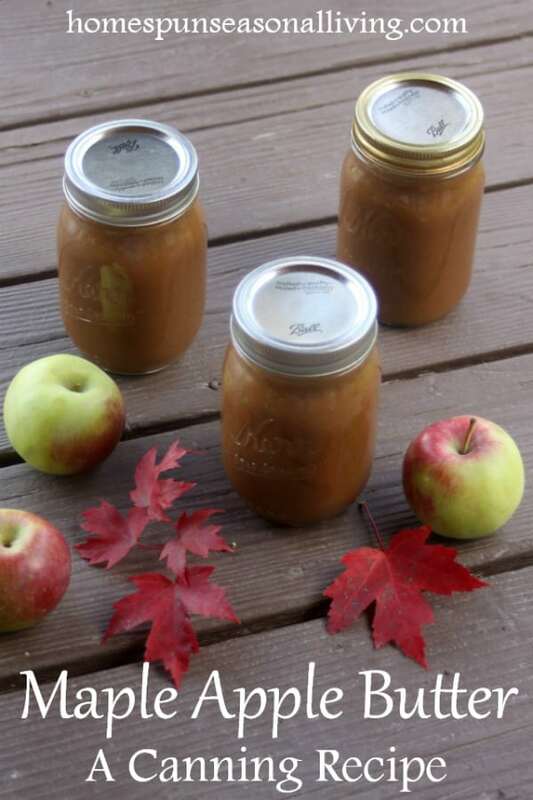 As this recipe is light on sugar and applesauce can be canned without sugar at all, I processed it as if it were applesauce (15 minutes, adjusting for elevation). Preserve the abundance of fall apples for winter eating and gift giving with this lightly and naturally sweetened maple apple butter perfect for canning. In a heavy bottomed stock pot, combine the apples, lemon juice and water. Cover the pot and bring to a simmer over medium high heat. Cook until apples are soft (about 20 minutes) stirring occasionally. Puree the apple mixture in a blender (or with a stick blender). Pour the pureed applesauce into a slow cooker. Add the maple syrup, apple juice, and spices. Stir well. Turn the slow cooker onto high and leave the lid off. Cook until the mixture is thick, it should mound up onto a spoon. Actual time will vary based on apples, slow cooker, etc. but figure at least 4 hours, potentially 6 hours. Prepare a water bath canner, jars, and lids. Pour the hot apple butter into hot jars, leaving 1/2 headspace. Remove air bubbles, wipe rims, place lids and rings. Process in a boiling water canner for 15 minutes (adjusting for elevation). 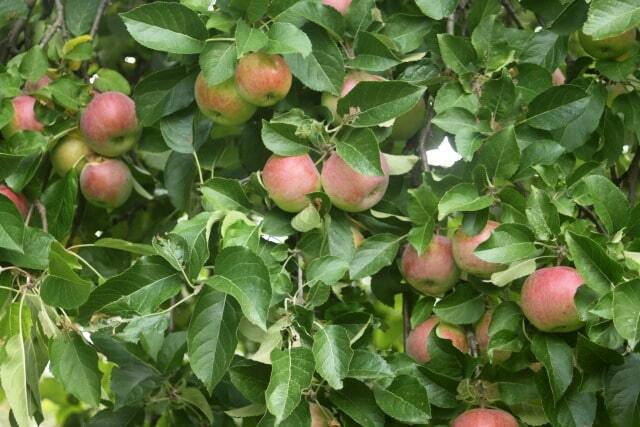 Have lots apples from our tree this year also. I am going to try a few of these the maple Apple for sure. Also chunky applesauce. so you don’t peel the apples? the peelings get chopped up that well? sure would save alot of time. I have a very high powered blender (a Vitamix) so results may vary but there’s no bit of peel left after blending in the blender in my experience. I cook my apples in the crockpot also. I am also blessed to have a food grinder/strainer for my kitchen aid. All I have to do is quarter the apples and throw them in the pot. No peeling or removing cores. After the apples are cooked down and soft, they just go thru the grinder/strainer and out comes applesauce, or apples to be cooked down more for apple butter! Hope this helps. Since I don’t have a slow cooker (v limited counter space), I did this on the stove top. It worked really well – so thank you! I used my Vitamix and the butter is super smooth. This is the first batch I’ve made without peeling my apples – a revelation, so much time and labor saved. 10 lbs of apples filled 10 x 8oz canning jars. So glad you enjoyed the recipe and lack of peeling!